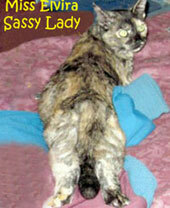 The Opinionated Pussycat: Laughter Makes the Whiskers All Twitchy! There Be Monsters...In The Litter Box? 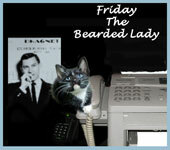 Good evening, felinity assembled, Friday the Bearded Lady here! It seems Sneakers awoke from a nap and went to take a dump and got spooked. She then woke Elvira to tell her about it and Elvira investigated. When Daddy got home Sneakers insisted that HE take a look. Here, daddy took 2 photos before he stirred the litter and checked for those "somethings" Sneakers swears she saw. Elvira Mistress of Felinity, here, with a question. Have you ever gotten in touch with your dark side? By that, I mean having your human take a photo of you using some filter on their digital camera or cell phone camera? 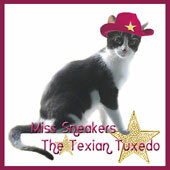 The other day Sneakers the Texian Tuxedo, Friday the Bearded Lady and I talked Daddy Kiril into using the "Negative Effect" in his Samsung Galaxy Avant cell phone and the results were quite startling...especially for the 2 Tuxedos. "It looks a little like flames! Since we Torties are all about dark colors, with some red and the like to brighten things a little, I was curious what would result. Listen up, friends of The Opinionated Pussycat! Nurse Elvira Mistress of Felinity, here, with important news! As regular readers of this blog know there is actually a 4th feline in the household, rescued by Daddy Kiril while on a bike ride in May 2013. Our Cast Iron compatriot has been seen in a number of blog posts over the years, even tossing its 2 cents in from time to time. Well, a few months back, when Daddy Kiril came home from work one Fall night, Sneakers succeeded in getting past daddy as he brought his bike inside and dashed outside. Daddy Kiril, in trying to grab her, lost control of his bike, and his balance, kicking our book reading friend away from its spot next to the door. In the process, the poor dear suffered a broken foot! Our friend is not in any pain, but we are not sure how best to safely reconnect the foot to the leg. If anyone has advice on what to use to do the job we would love to hear it. Good afternoon, felinity assembled...we have been preparing a lot of blog posts today and this one was intended to share our pleasure with a very kind after-Chrissymouse gift we received last week. 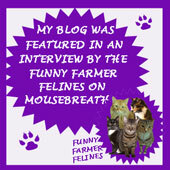 Those plans have been altered a little as we, like many in the cat blogosphere, were saddened to hear the news from Miss Ellen, the human of the cats at the blog 15 and Meowing. Stinky had been dealing with some medical issues and her family was worried even as the vet did all they could to help. 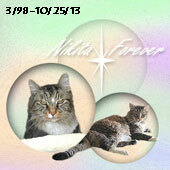 Alas, Stinky went to Rainbow Bridge yesterday morning and we send our purrs and purrayers to everyone at this sad news. 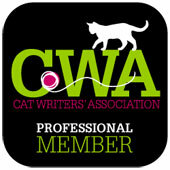 As readers know the gang and their human have been encouragers of our work and frequently were linked in the Carnival of the Cats. Daddy Kiril joins us in sending condolences as well. With the input of Stinky and the rest of the gang, no doubt, Miss Ellen surprised Daddy Kiril and us by sending us some of her special catnip crocheted toys for cats, a cute tiny red hat, and a feather wand toy. We hope that the photos that follow bring smiles to their faces, in the days that follow, as they deal with the loss of Stinky. We thank them so very much and, as you can see, their kind gifts are a big hit around here, though daddy still has not succeeded in talking any of us into wearing the hat, hee, hee! We apologize for the quality of some of the photos.... Since daddy is unable to get a new camera we are stuck with the cell phone and it is not always up to the challenge. Do You Have Vishus Deer Guilt? It's Election Day for the Humans: Remind Yours to Vote! Share your thoughts in the comments and, if you do a related blog post of your own share that in the comments and I will promote it to an update below. If you have a twitter account, well, read on, hee, hee! Daddy Kiril enjoys listening to the Doc Thompson radio show on The Blaze and recently I awoke from my morning nap to hear Doc & Skip humorously freaking out over the humans googling cat pictures so much. I have created a list based on the topic of "Yes, All Cats..."
The idea is to begin a sentence with those 3 words and go from there without using more than 140 characters, as in a tweet.